Your wedding ceremony is scheduled forcool period of the year? Then, an important part of the wardrobe should be a wedding shawl. Beautiful product, gracefully draped over his shoulders, can not only preserve the elegant image, but also reliably protect a frosty wedding day. This piece wedding dress style will give the bride a touch of mystery, elegance and mystery. Quality. As shawl fabrics of natural fibers to be used. Make sure to fur, fluff products do not fall out and not remain on clothing. The size. This parameter should be given special attention. The main function of the shawl - the bride warm, so the product must be of sufficient size to completely hide the shoulders, but did not look dimensionless bag. Price. Cost shawls depending on where it purchases the complexity and size of the pattern, the quality of the material. In wedding salons such an accessory will be expensive, but in the usual shops selling shawls, the bride can choose a cheaper option. Style. Models shawls diverse: they can be shorter or longer, to consist of organza, lace, tulle or cashmere. Colour. For classic white wedding dress is chosen scarf of the same color. If the dress with a beige tone, pick accessory breast colors. Decor. To decorate the wedding shawls use rhinestones, beads, beads. The more decorations on the mantle, the higher its price. However modestly decorated scarf can look better, since it does not distract the attention of visitors from the main attribute of the occasion - the wedding dress. 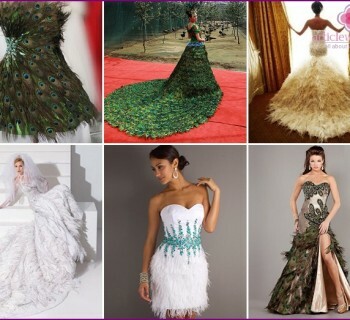 Choosing a style products for marriage dependsthe time of year, when there will be a solemn event, the wedding dress model, the overall style of wedding, personal preferences of the bride. 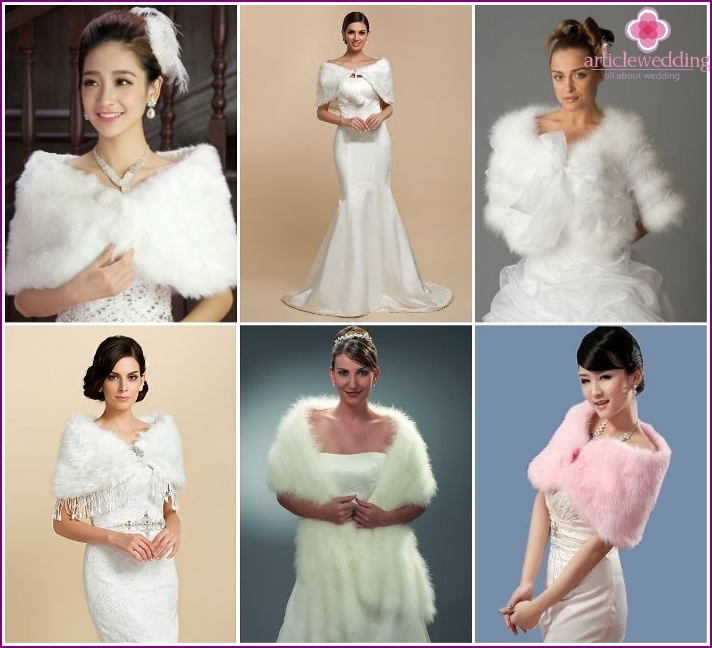 To keep warm in the winter on a holiday, ideal fur or feather shawl for wedding in summer useful product organza, in the cool autumn days, a good choice would be knitted lace wedding shawl. The bride in a luxurious wedding dressbare shoulders and open neckline looks incredibly tender, touching, defenseless. But during the wedding you must cover the shoulders. For this handy Air tulle shawl. If there is no veil, the wedding will be relevant to a wide shawl, decorating the girl's head and covering bare chest area. In order to achieve the air image of the bride, using tulle, decorated with lace. Chic option - translucent shawl, adorned with hand-painted and original embroidery. Rabbit Fur. In the bitter cold soft, warm shawl rabbit will be a wonderful decoration for the bride. This product is not only in white color, there are other shades: ivory, beige, sand. Mink fur. Owning a mink shawl emphasizes the high status of women, and its luxurious appearance makes the bride in the fairy-tale snow queen. Fluffy, soft mink will be unmatched detail image of the bride. Fur fox. Truly the king's product is considered Pestsovaya shawl, she looks very presentable and impressive. Fox fur. Brides who love being in the spotlight, will appreciate the shawl from the fox fur. They are characterized by elegant appearance, thick, shiny, long fur and a wide variety of shades, from pale to bright red. Swansdown. To create a romantic autumn wedding image bride with visible fur in clothing, used swan's down. His villi resemble soft fur, and a feeling that the girl dressed in the cloud. Artificial fur. With ethnic beliefs about the use of natural wool or animals in order to save money, the bride choose an artificial mother. In view of such a product is almost indistinguishable from the real accessories. Quality. The inscription on a product in the store, "Do not touch" should be cause for concern, because a good fur shawl withstand a lot of touches. The softness of the material. The harder and harder fur, the colder will shawl. The weight. The heavier the shawl, the warmer it will be, but should be the measure. The maximum weight of the product shall not exceed 1500 grams. Color. Spend on fur shawl with a piece of cloth, if it will turn, means that the material of poor quality enhancement. 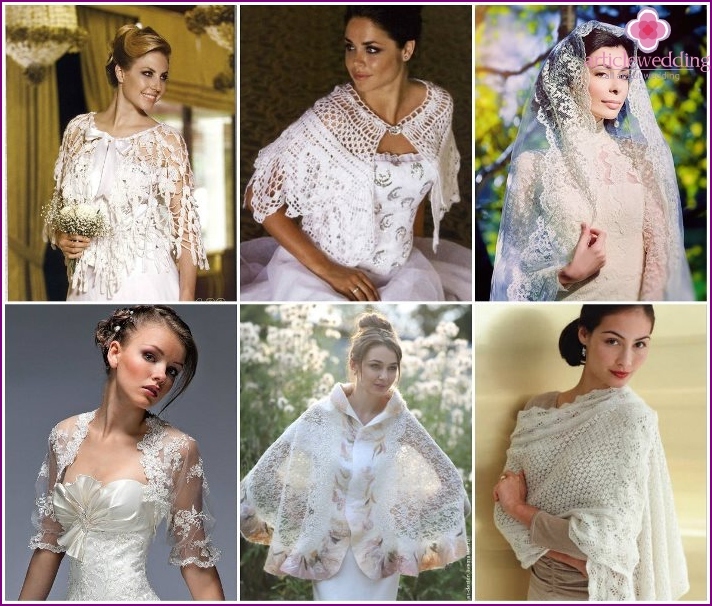 Knitted shawls are back in fashion, they becomean excellent addition to any autumn and winter image of the bride. Most interesting products performed using the technique of lace knitting or crocheting needles. 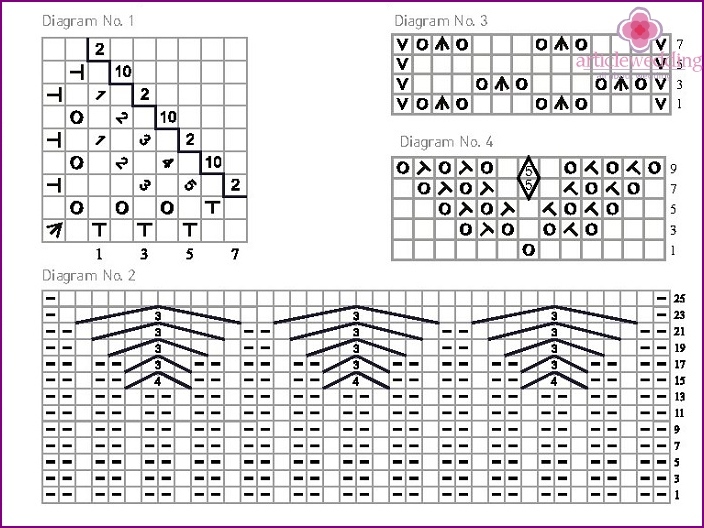 To get a close pattern in knitting, using knitting needles, a hook used for filigree patterns. Figure mating is diverse, very popular figures in the form of squares, diamonds, flowers, Slavic ornaments. Garnish with a shawl with a picture and select it helps small decorative elements: vyvyazannye beads, beads, droplets, crystals. With such a product as a shawl is excellentlook any wedding dress. It is particularly suitable for long dresses nepyshnym: Greek or vintage style. The winning combination will be a short wedding dress and shawl elongated. For along with lush skirts pick up items that cover the shoulders slightly. The main thing here - highlight the waist, so that the figure is not to get a blurry. In cool weather to warm up, the brideHe can throw on the shoulders of knit jewelry. If you are familiar with knitting needles, you will not be difficult to make your own shawl. Get the yarn. For high-quality product masters recommend not to use synthetic fibers, or related shawl will keep bad shape. The percentage of synthetic fibers in the yarn must not exceed the mark of 40. We collect 11 loops and knit in the following sequence: 5 sts dvuhiznonochnoy viscous nakida 1, 1 front, 1 nakida, 5 loops dvuhiznonochnoy viscous. 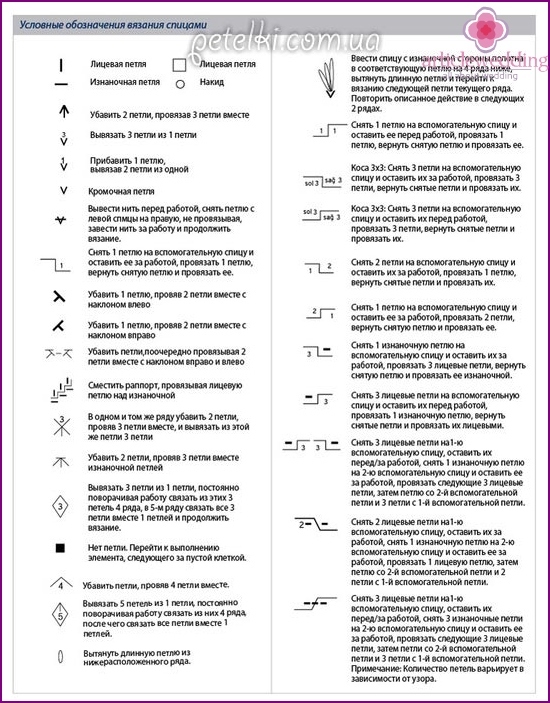 The inverse ranks provyazyvaem nakida purl and add the 4 loop. Continue knitting each row making personal nakida of 5 garter loops and 1 front loop, while the spokes does not reach 171 loop. When the product reaches the height of 2 cm continue to knit using Scheme 3. At a height of 36 cm shawls, begin to knit without adding extra loops. Then every 18 loops provyazyvaem rapport indicated in Figure 1 (figures show the number of increases, executed over a certain loop). Linking 9 series in the scheme number 1, continue binding on the scheme number 2. Then perform rapport scheme 3 and 1 cm wide section provyazyvaem front embroidery. Starting from the next row, provyazyvaem at each end on 5 sts dvuhiznanochnoy viscous, performing 1 nakida. One central loop do the front. Next, knit, making each side of the front loop of the series 1 and 1 nakida. Knit in this portion of the article 12 rows continue mating scheme 3. Doing this width of 9 cm, repeat steps 6,7,8. Linking repeats, shawls hook tied to the edgethis order: 2 loops diminish, knit 3 loops together, then knit chain of 8 stitches, 2 sts again diminish, knit the next 3 loops together, continue in the same way until the end of the series. This comfortable piece wardrobe suitable bridein different periods of the year: for hot summer - thin and light products, for the cold winter - warm fur, feather. An important advantage of shawls - great compatibility with absolutely any outfit, needs girls with any type of figure. Especially beautiful shawl looks at wedding photos taken during a wedding, for a walk.